It seems amazing to me that an operation as large as the Mission Mill evidently was, can have so little information concerning its owners and operation to be found. But I'll bet the information is out there somewhere, I just haven't looked in all the right places yet. 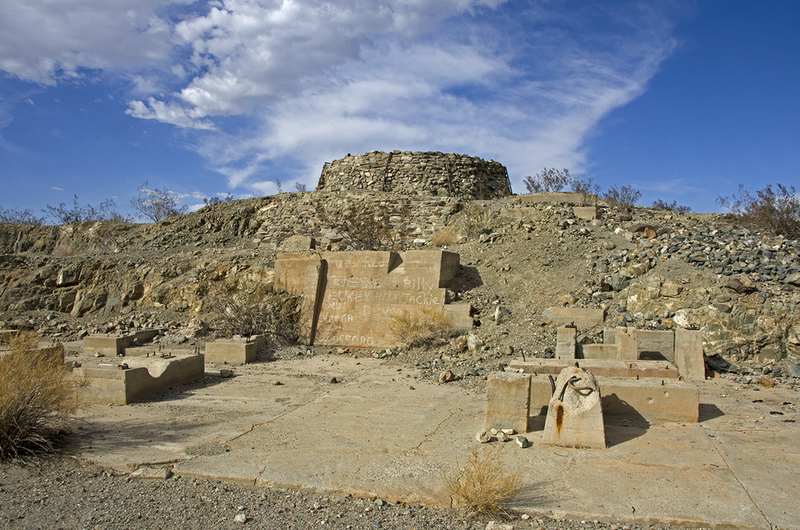 The Mission Mill ruins are quite impressive and certainly attest to the importance of milling facilities in the local mining districts. The Mission Mill was a cyanide facility, and it was a busy place during its operation. This vat is mostly gone; weathered or eroded away. But look at all that sediment that was left inside it. I wonder if there's any gold in it? I wonder how this vat got from the platform to where it is now? 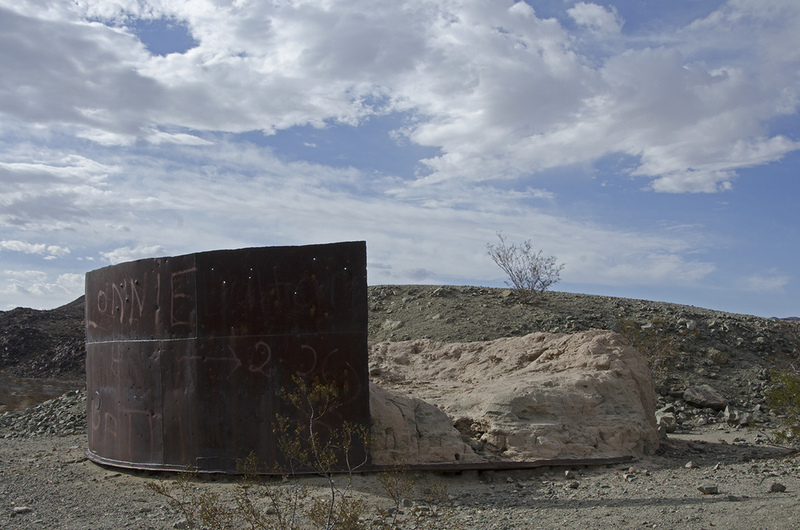 Two large metal vats, or portions of them, remain. The more or less intact one sits on the side of the hill, but was reportedly originally located on top of the circular stone support structure at the top of the hill. There are several levels terraced into the hillside, some still supporting concrete machinery pillars. The pile of slag on the left looks similar to what was in the vat on top of the hill. I wonder if the waste material was somehow treated a second time and run through this trough-thingee. An interesting trough, for want of a better word, is built into the side of the hill under the partially decomposed metal vat. It has a square hole at the top and then channels into a small gully. Perhaps it was some kind of sieve. After I had given the immediate area a pretty good wander, I decided to walk around the base of the hill the mill sat upon to see what I could find. The north side of the hill proved uninteresting but as I walked along the southern base, heading west, I saw something that was absolutely amazing (at least it was to me). I stopped in awe as the largest tin can graveyard I had ever seen stretched out before me. Is this where they all come from or where they all go? Now I've seen and poked through a lot of mining camp dumps in the deserts, but this is the largest one I've yet discovered. It looks like a lot of people spent a good amount of time out here, to go through this many cans. When you think about it, canned food must have been pretty much what the people who lived out here ate to survive. It's unlikely there was any refrigeration, so meat or vegetables wouldn't last long if they were brought in at all. I can easily spend hours in such places, but then, I don't get out much. Some folks might consider areas like this a blight on the land, trash that should be collected and disposed of. To me, it's an important part of the history of early settlements in the area. Hopefully 'dumps' like this will be left for others to enjoy. This was one of my favorite finds of the day and I took a bunch of pictures. They liked their regular joe. The Mission Mill is located (33.961387° -115.692880°) approximately 10 miles in on the Old Dale Road, which branches off from Pinto Basin Road about seven miles north of the Cottonwood Visitor Center. There is a parking area located quite near the site. It's definitely worth a visit. It's a dirt road all the way, so a 4WD vehicle is recommended.